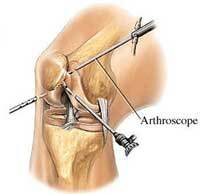 Arthroscopic surgery is a minimally invasive procedure that is used to treat various problems of the joints. Arthroscopy is generally done on an outpatient basis and is commonly used for the treatment of knee and shoulder joints; repairing cartilage and meniscus problems in the knee, and removing inflammation and repairing rotator cuff tears in the shoulder. A mini camera is inserted into the joint through a small incision. The arthroscopic surgery camera is attached to a fiberoptic light which translates an image of the inside of the joint onto a monitor for the surgeon to view. Water pressure is then used to "inflate" the knee to allow better access and to remove any debris. Depending on what the surgeon sees other incisions can be made to insert specific instruments that treat the underlying problem. For instance, a shaver can be inserted to trim the edges of a meniscus tear. Arthroscopic surgery is a "less invasive" procedure and is often very successful. Even though rare, the arthroscopy procedure is still a surgery and all surgeries do have some risks, such as infection, blood clots, etc. Not all conditions are best treated with arthroscopic procedures. Dr. Kehoe or Dr. Hanlon will discuss with you if arthroscopy is a good option for you.